Aching. Throbbing. Waves of nausea roiled and toiled within the heavily drugged femme. The dark, sweat-drenched hide shuddered, tremors racking the body, like a leaf shivering in a wintry breeze. Eyes opened, but they could not see anything. Darkness.. where am I? The inevitable question echoed about her cranium, rebounding off the inner walls of her skull over, and over again. There was a deathly silence surrounding her, enveloping her. Finally, after what felt like a lifetime, her eyesight slowly crept back to her, first offering blurry smudges, obscure shapes, before she instinctively squinted as a particularly bright reflection nearly blinded her. A warm bundle rested by her side. It was then she realised that she was laying down, and that the bundle beside her was a dragon. Her dragon. Akaith, she communicated, reaching out with her mind like she had so many times before. There was a moment where she waited, expectantly, for the comforting caress of her dragon's beautiful mind. But then, it did not come. Akaith! she exclaimed again, and worried as the dragon did not rouse from her slumber. A sharp snort rushed from the nostrils of the mare then, rippling the finely crafted nostrils, the expression travelling across the entire sculpted façade of the mare as concern etched itself into every crevice of her arabic featured crown. A groan escaped her, unwillingly created with the effort of her twisting, strained movement to reach her soft muzzle closer to her beloved bonded. "Akaith." She said again, her voice cracked and out of practice; it was then that she realised her throat also ached. Her breath was held again, as she awaited a reaction, and when the little queen uncurled her golden form and blinked a few times before focussing upon her, a tightness in her chest unwound, as relief swept over her. The dragon purred softly in recognition of her bonded, before tilting her little crown curiously as she to realised the numbness of the bond between them. The little dragon seemed to cope better than her bonded, however, as she promptly rose and pushed herself nearer to Mirage's head, making small sounds of comfort and assurance. It was then they reassessed their location. They were within a cave, and the feel of the chilly breeze upon their faces told them of the northern aspect of their location. The land before them looked vaguely familiar - they knew, at the very least, that they were still within Helovia. The mare gathered her strength, so that she may rise and view where it was they truly were. Akaith wandered away from her bonded, allowing the mare more space in which to rise. Coughing seemed to want to interfere with her efforts, the strained breathing taking its toll on her - just standing was difficult. What happened to us, Akaith? It was such a habit to ask for her bonded's opinion, she felt a tremendous sense of loss all over again at the lack of reply. Slowly, but surely, the memories and dots began to join together. Her throat ached due to something she ingested - a poison? A sedative? Her sides ached from where she was roughly beaten and forced to travel northwards. Akaith had been dancing a fine line between consciousness and unconsciousness, all the while managing to cling to her bonded's mane and make the journey with her. Unicorns, Mirage recalled, vaguely recollecting the fact that her captors each held a horn upon their brows. So this was her punishment for taking what they held so dear, for challenging and winning their home from their very horns. The frenzy of stolen herdmates recently had indeed set the mare on edge, her sense of failure as she was not able to protect them all had caused a large sense of guilt to settle upon her, adding to the guilt she already felt over forcing others to leave their homes so that she might live in comfort. With a strained step she wandered to the lip of her cave, and directed her golden vision about. The air was thick with the stench of the horned fiends; she wondered whereabouts her guard would be. Xanthos could not believe what he had done. This was not him, a stallion sneaking into another herd and beating down another to get them to follow, especially when that other was the Weyrleader of Dragon's Throat. Perhaps he had finally snapped, and everyone's racism towards those that did not fashion a horn was rubbing off on him. "No," he had quickly told himself with a shake of his head, "This is to prove myself not some dimwitted fool. This is to protect Romani and her beloved home." While he held no particular vendetta against the Dragonheart, he knew that that wasn't the case with members of the Ex-Edge, or more recently, Aurorans. She was the one responsible for the invastion that ran the unicorns out of their home, and now, she would receive punishment. Admittedly, he was estatic to see their reactions when he came home with his prize in tote, but none more than Psyche's. Of course, the Crux had been taken, as well as his Corporal, but if everyone was out to get Mirage like he thought... Well, he was sure it wouldn't be terribly hard to keep her within the Basin. After all, would she even know where she was when she awoke? Before leaving, the stallion had scoped out a wide, but short cave, and that was where he had taken the Weyrleader until she was back on her feet again. Like a prison guard Xanthos had stood just outside the mouth of the cave, and when he spotted her black form moving ever so slowly towards the exit, he knew it was time to make himself known. Despite his first instincts to apologize, the unicorn knew that such words wouldn't get him anywhere. Inhaling deeply, he stepped forward, yellow eyes lingering upon Mirage's for a moment before he spoke. "How does it feel to be on the other end this time?" His voice came out evenly, despite the tinge of anger he truly did feel. "Being taken from your home... How could you do that? Even if the Edge had not been his home, he didn't think the outcome right at all. Then, what he had heard the Sun and Time God speaking of back in the Steppe... Was it true? The mare was ignorant to the existence of the Time God, at least she would be until the effects of the drugs wore off and she was able to more clearly recall conversations with her sister, who spoke of meeting a curiously painted stallion who seemed to step across the realm out of a different dimension entirely. As it was, however, Mirage could only assume she was in an unknown portion of the Steppe, a land she had been to only a handful of times before, and even then she hadn't ventured far from the frozen bridge that had given her access to the lands that were permanently frozen. The new angle in which she peered at the lands, however, did make her wonder. The scents of unicorns lingered, they were strong, obvious, seemingly settled into place - though they hadn't been for long. She could assume that it was a similar situation as when she, and the followers of the Qian, had made the Deep Forest their home, but somehow the idea didn't quite stick with her. Somehow, she felt this was a permanent abode.. And yet, how was she to know more without anyone telling her? Sights lifted to view her captor, eyeing the dusty hue of his coat with disguised interest. Her expressions displayed nothing of the hunger for knowledge she felt, rather, they reflected nothing more than a sullen, bored and vacant stare. So this was the fiend who had so roughly forced himself upon her. She wondered, idly, how he had managed to poison her - it must have been while she was grazing outside of her home, or perhaps, while she was feasting upon the flesh of a deer with her bonded dragon, in her own dragon form… No, if that had been the case she would have woken up still in her dragon form. How then? Thoughts of her magic did leave her curious to wonder if the stallion even knew of her abilities, how did he plan to stop her from cloaking herself and simply walking home? How did he plan to stop her if she transformed and simply bit his little horned head off and flew out of here? Perhaps he was wiser than he looked, for Mirage was no such creature, at least not right now, as she recovered from ingesting whatever poison he had managed to slip her. He was all bravado, as he waltzed closer to her, looking over her with his sharp, amber eyes. Akaith leapt to her withers, scales standing on end and wings flaring as she warned him not to venture within the reach of her claws or her flame. With the years they had spent together, it was surprisingly, and yet perhaps not so, that they adapted to the lack of a mental bond tying them together. The love they felt for each other was still there, even if not directly palpable. "I sought a home for my kin, a home that was withheld from me due to a lack of a horn upon my brow. Then I sought guidance from a celestial being, and was directed towards the path that would give my what it was I sought." Her voice was accented, an exotic curl different to any other flavour his ears might have tasted previously. The tone with which she decorated her words was bland, nothing but informative. "I did not exile your kin; the World's Edge is open to any who would accept my rule." She added, wondering just what this stallion's true motivation for capturing her was. She did not recognise him from the battle front - but then, she was mighty distracted with keeping herself alive, and defending her brethren at that time. "One thing I have learned, is that life is unfair. Even the laws of the land dictate that someone will always win, and someone will lose. I can only do my best to ensure my, and my brethren's survival." Still she spoke with little emotion, nothing aside from the truth in her words were proffered. Akaith settled slightly upon the small of her back, her growls becoming somewhat softer, though still present. It was true; now Mirage was the 'loser' of the situation. And no, she did not like it. But she would not let that affect her, not while she was in the camp of unicorns seeking revenge. Let them have their revenge - if they take it out on her, then perhaps they would leave the rest of her herd alone. Somehow she doubted she would be that lucky. Xanthos could say he was surprised by the calmness that the mare displayed as she spoke. Her voice was unlike any other he had heard before, and for an instant, he wondered if she was even native to these lands. It almost seemed she didn't care about her situation, but that was impossible. Who could simply shrug off the fact that they had been drugged and stolen away to a land full of loathing, vengeful unicorns? His ears tipped back after she had spoken, giving him a thoughtful expression as he mulled over her words. Why had she sought the Edge when there were others lands to choose from, others that did not care whether or not a horn spiraled from your forehead? And even if she had come to welcome all species, the fact remained that she had ran the now-Aurorans out. At the mention of a celestial being, the grullo knew instantly that she must have been speaking of the Goddess of the Moon, for that is who the Gods must have been speaking about back in the Steppe. It would only make sense. "But why the World's Edge?" He inquired, carefully watching the mare for any change in her expression, "I mean... There are other lands, free of my more racist brothers and sisters." As he spoke, Xanthos felt that maybe, just maybe, he and the Dragonheart were more alike than he had originally thought. He was here in the Basin, somewhat against his will, and he did not agree with the ways of Psyche or the others. He had found few who thought the same as he, Faelene the only one coming to his immediate thoughts. His breath came in tendrils as he exhaled, the chilly breeze carrying it away at once. His attention drifted briefly to the dragon upon the Weyrleader's back, sensing her discomfort of him, but Xanthos assured that he kept a respectful distance from the pair. The golden dragon hadn't asked for this, and while he didn't understand the bond between an equine and a companion, he was sure she didn't entirely understand what this was all about. He might have been a little rought to get him here, but it was definitely against his nature to do anything else. Unfortunately, he couldn't say the same for the rest of his kin. "I cannot deny the truth of that," Xanthos replied as she spoke again, still with little emotion from the mare. She seemed only interested in spreading the truth, instead of spitting and hissing at every little thing that was said. A good quality in a leader, in his opinion. For a moment he seemed to think, before drawing in a deep breath to go on. "You may think as you like, Mirage, but this is not something I wished to do. Especially when I've not even met you before. I can promise nothing to you, and it is foolish of me to think possible, but I hope my kind will resolve this with as much diplomacy as possible." It was a laughable statement, indeed, but one that he truly did wish for. He spoke, and in his words, there was a wealth of information. Racist siblings - she was intelligent enough to know that he was not speaking of biological siblings, but rather, siblings in the same sense that her own herd were her brethren. 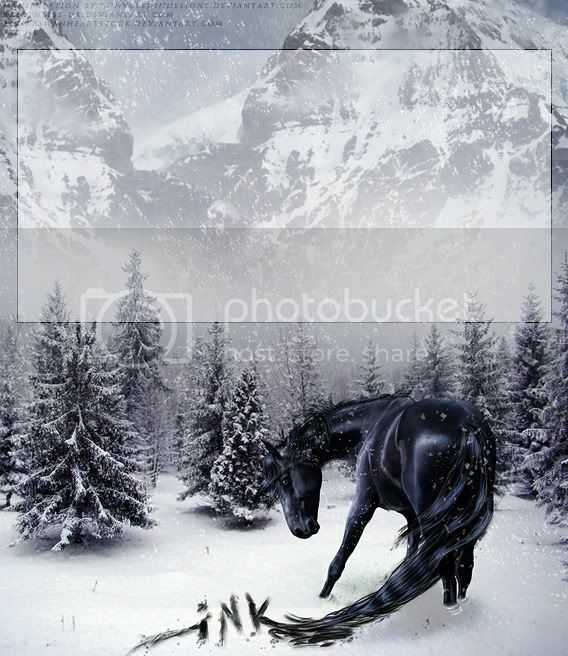 The mare had wondered at the exclusivity nature of the unicorns who previously habited the Edge, while she had never wanted to definitively accuse them of racism, here now was confirmation that it was so. The mare had never known racism, at least, she had never felt herself judge another for the horn upon their crown, or wings at their sides, or neither, or both. Her mate was a stallion with dragon blood altering his appearance quite dramatically - perhaps the mare was attracted to the strange, perhaps that was why she was not a racist herself. It was curious for her to note that this steed did not seem to include himself in the statements he made about his kin, that he held himself apart from them. Did he see, then, that she was not an abomination simply because her sculpted façade lacked the refined edge of a horn growing from her brow? He seemed, almost, apologetic, not entirely sold on the idea of capturing her, torturing her for information or otherwise exacting his revenge. Her words seemed to have affected him, or at least, repeated thoughts he had probably thought up himself already. It was curious, that the one to capture her would be the one unicorn in a horde of many who might understand where she was coming from best of all. "My life had always been directed by the Moon. It was only right that I should at least attempt to earn the right to call her sovereign lands my own home." Once again her words left little for the imagination to gleam, she gave her reasons, linked them to her past and yet did not reveal anything more than necessary about herself. There were more reasons than that as to why the Edge had become her goal; but that was the most important one, the one that she believed had earned her the right to have audience with the Moon Goddess, to be blessed and sent forth into victory by the pale maiden. There was little point in divulging the details of it all, the politics and trials she had faced in order to feel secure enough in herself to face the formidable force that was the former World's Edge herd. "You are kind, steed, for even I do not think myself deserving of diplomacy." The mare still did not know his name, and yet still she paid him the small compliment. The statement she gave was the first hint of emotion, as her tones lowered, her voice hushed to almost a whisper, and her eyes sought out the horizon ahead of her. A small sigh expanded her barrel briefly, before her nostrils flared and the air once again joined the atmosphere. It was subtle, but there was perhaps, a flash of regret upon her brow as she considered the lands before her. However, before it could settle for longer than a moment, a breeze stirred her mane and the neutral, guarded façade once again took place. She did not regret her actions, so much as the consequences of them. She had not meant harm; rather the opposite. Collateral damage was an unfortunate side effect, one that she was obviously, still dealing with. "Akaith, do stop grumbling." It was a soft admonishment, meant for the little queen who continued to hum her displeasure as she sat and observed the primitively hued steed. Normally, she would have soothed the drake with their bond, but having that numbed meant she had to speak her thoughts to the dragon like she would any other creature. With a little huff, the queen paused in her low growls, pointedly keeping an eye on the unicorn, whilst turning her magnificently scaled form about and climbing higher up Mirage's neck. So, the Moon was the Edge's God. Still new to Helovia, Xanthos had not gotten the chance to learn about much other than those associated with the Plague and, of course, Romani. Once this was over, and depending on the outcome, he would promise himself to change that. Mirage still displayed little emotion, and was holding back all the juicy details to what had happened, he knew. He would not press for them, however, for it was not in his nature to do so. He was oblivious to the trouble that the Weyrleader had gone through to obtain her victory, but if she had won the Edge fair and square, he couldn't hold it against her. His kin could be as sour as they like; after all, they could have always challenged the new herd back. Her compliment had taken him by surprise, and he did not miss the change upon the mare's face when it happened. But, of course, it was gone almost as quickly as it had come. "Perhaps," he spoke in reply, his voice having lost it's miserly edge entirely, "But you do not deserve a beating, either. Unfortunately, it matters not what I think to the others." He paused then, his eyes turning to the dragon clinging and crawling up alongside Mirage's neck. The golden stygian was a curious creature indeed, for Xanthos was not sure he had ever seen such a thing before. He knew of companions, but he did not recall any of the Aurorans having such. If their situation had been different, he might have asked about the little dragon Akaith, but there were more trying matters had hand. Releasing a haggard breath, the grullo craned his neck to see if anyone else had come running to join the pair. It was surprising that they had remained alone this long, but he wasn't complaining. There was no denying that he had taken the Weyrleader from her home for his own gain, he had selfishly admitted to himself, and the only one he wish to join them was the Empress herself. Even on the way back to the Basin, Xanthos had wondered what she and the other members would do to Mirage, and he had battled with himself every step of the way home. But no, he had done Psyche's bidding, as much as he hated to think so. In the end, it was for his own and Romani's welfare, and maybe even gain back the respect Elizabeth had held for him in the Threshold. He could not forget the threats spoken back in the frozen Steppe, or at the Endless Blue. "Whatever does happen, Mirage," he went on once returning his gaze to the mare, his eyes gleaming with the true emotion he was feeling, "I am sorry." A black hawk circles in the sky above. Its height and flight pattern suggest it is on the hunt for prey, but as yet unsuccessful in locating it. Seemingly aware of this itself it begins a slow spiral closer to the ground, silent in its stealth. The wind rips through my body, sometimes scattering drops of ink from my core. They splinter into smaller sizes and dissolve before ever striking the ground. The higher I fly the more the wind slices into me, but the lower I go the more likely I am to leave a blotchy trail. I try to flirt somewhere in-between, at least until I am sure of what I see. There are two figures below me, horses, I gather, but I'm too high to know more. My recent intel suggests this is the latest domain of those refuging from the Edge herd. Those we defeated. Those who are thieves. I sweep my wings to the side and drop down several lengths in the sky. Closer to the ground I can clearly identify the dark coats of the two horses, and more importantly, the bright reflective one of the golden dragon. I grin. I drop into a sudden dive, feigning the pursuit of a mouse in the tundra near them, yet I miss the imaginary mouse and sweep up into a crop of rock close to them. I land with my back to them, head cocked only a little so I can finally see in detail the frame of Mirage. Absently I preen my inky feathers, hoping to over hear whatever it is they're saying. She seems uninjured at least for now, more than I can say for the other prisoners I saw last time I was trailing this group and took Kiara back with me. Charred ears tilted slightly as they caught the words the unicorn steed, the waters of Mirage's mind slowly becoming clearer as thought processes continued chewing the implications. The sedatives seemed to slow her mind to, but as they wore off, as standing became more bearable, the speed at which she as able to process her thoughts seemed to increase, to slowly return to normal. It was puzzling at first, that the stallion would steal her to gain esteem amongst a crowd of unicorns whose beliefs he did not share. The mare had to wonder, if he had met herself, or another from the Qian first, would he still have turned to his own kind, to the group of outcasts who promised nothing more than a united front against anything without a horn? This was, of course, assuming that the stallion spoke the truth, just as Mirage was speaking the truth. Could they both have been lying, to each other, to themselves? No, there was one thing Mirage was not, and that was a liar. Though it was comforting in its way, how the stallion seemed to wish no harm upon her, he still had been the one to capture her, to thrust her in the hands of this new land, to guard her, stop her from leaving as she wished. Why? Did he not realise that in everything, he had a choice? He could choose to release her, to prevent the harm that would surely scar her when his herdmates arrived. He apologised, and this was yet another twisted piece thrust into this messy, undone puzzle. Eyes of liquid gold refocussed upon him, this time they softened, the compassion and kindness that usually beheld them finally breaking through the mask of indifference she wore. There was a sadness present too, one that spoke of different circumstances, of a chance where something akin to friendship might have been forged between the dun and the black. The expression was short-lived however, and did not venture past her soulful eyes. In that glance she shared with him, she tried to communicate that she did not blame him for what he did - he was only acting on what he thought was right - just as she was. "It is curious, that I should come to like and respect the one who captures me, as if they are but another comrade, performing his tasks with efficiency, acting upon what he believes in." Her words were thoughtful, her expression faraway. It was as her eyes peered at he horizon once more that the inky mass, a dark bird, dived down to the trees. Akaith, with her sharp, predators gaze, tracked it keenly. A call, a bird-like summon, rang from her maw then, a near-perfect imitation of a hawk of that size. Mirage's ear instinctively flattened against the call, for it came from the dragon upon her back, loud and clear. Being unconnected to the gold, she had no idea what information she had gleamed from the sight of the dark bird. For all Mirage knew, it was just another bird, one that Akaith had taken a fancy to hunting. But the dragon did nothing more after her call, besides a simpering whine as she resettled atop her bonded's nape. How frustrating. Mirage could only think, before she allowed her attention to float back to the stallion, whose name she still did not know. "They obviously have faith in your abilities to keep me captive. Surely you deserve more recognition for successfully holding the one who leads the World's Edge?" It was a compliment, in a way. He had hinted in everything he spoke that he felt distant from the beliefs of the rest of his herd. Why was it that he worried so much about what others thought? When Mirage regarded him with a look of kindness, of all things, Xanthos was visibly surprised. He held her gaze for a moment before breaking it, glancing away only briefly. He was, of course, unknowing of what she was truly thinking, but her flicker of emotion spoke a thousand words that she was unwilling to say herself. It was the sound of Akaith's cry that pulled the steed from his thoughts now, his yellow eyes snapping to the creature and then shifting to scan the pale skies. It seemed nothing but a bird, surely catching the carnivore's attention. He had not closely observed the fauna here, and although quite unusual in its looks, he paid it no mind. Mirage's words came upon his ears once more, and holding back the urge to snort, he merely shook his head in answer. He had tensed, as anymore, the mere mention of Psyche and the others had him on the edge. "They are unaware of my abilities; they seem only to worry about one's hatred towards the other species than one's ability to do anything else." He paused then, rather abruptly, regarding the mare with his own look of kindness, and sympathy. Even sharing few words between the pair so far, she had managed to draw out his true feelings, and he wasn't sure if it was a good thing or not. "... Pardon my ranting," his voice was now a great deal calmer, and with a flick of the tail, he relaxed. "I am Xanthos, Dragonheart, so you need not call me 'steed' anymore." d'Artagnan laid dual eyes on the landscape before him. It's tough tundra, looming mountains and warm caves. A perfect land for the former Edge and Plague. For racists alike who shared the same ideals of a unicorn dominance, there were of course those who remained here and said little. These faces the shade didn't know too well, didn't know what they wanted and it was on this day that the Nightshade came to look up Xanthos. 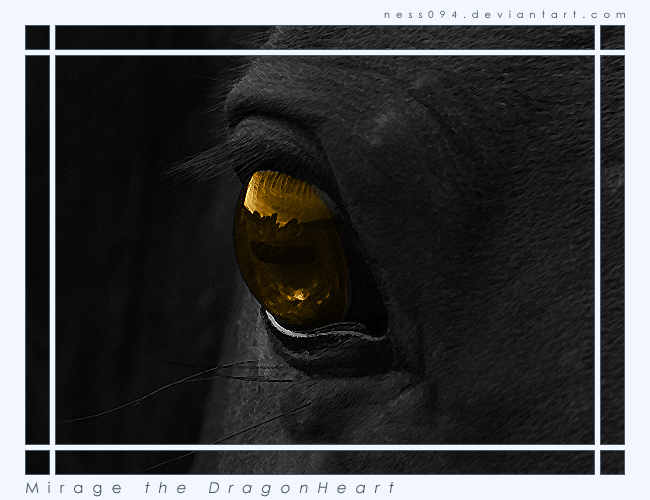 The stallion who had enough skill to steal the leader of the World's Edge, Mirage the Dragon Heart. Intriguing he hadn't heard of him more as the shade took another right turn and headed towards the cave in which the buckskin steed held his captive prisoner. Folds of mane coloured in pitch hung in wild clumps on a blood stained coat, a lone silver marking filling his flanks in a series of moons. A reminder of Mesec, a demi-god, who he hadn't seen in a while. It made him wonder if his son had gone to find his mother, and if he had reached the Basin yet. Who knew, the boy was the child of a God and so his power was unmatched. d'Artagnan needn't worry about him as much as he did Aviya, who had already made herself at home in their new land. Kou keeping a watchful eye on her. Hooves cracked in tradition of an old species splashed through melting snow, his pace like that of a stalking predator as he made himself known to the pair before him. Pools looked at Mirage, had he ever seen her before? Or was this the first time. No. There was one time in the madness of the Sun when she came in help, and little did they know what she was really plotting. Those with a head so pitifully bare could not be trusted, this mare of shadows more than proved his opinion. Her golden dragon seemed too interested in a hawk, hungry maybe? The shade cared little in the way of dragons, perhaps foolishly so. "Xanthos. A skill to be honoured indeed, well done in capturing our enemies lead." He praised the other stallion in his gruff, brusque tones. Psyche surely would be happy with him, but she was not here to to revel in their success. Instead d'Artagnan conveyed the gratitude in her stead, fitting into his title as Time Mender like one put on an old boot. The magic was different but the meaning was the same, heal your comrades and poison your enemies. Simplicity was always pleasing. It was a curious observation to make, this discussion between equine and unicorn. The little black mare spoke only words which she hoped would gleam a reaction, and in doing so, she was fed information that gave her hope. Hope, you see, was what kept her going, kept her standing, kept her concentrating on finding her magic once more. Whatever it was they had slipped her, she could not feel the hum of her magic near to her any more, could not feel the instinctual caress of her illusionary cloak, nor the beastly echo of a dragon within her breast. The effects would wear off, of this she was sure; no one but a God could work a curse harsh enough to remove one's magic permanently. 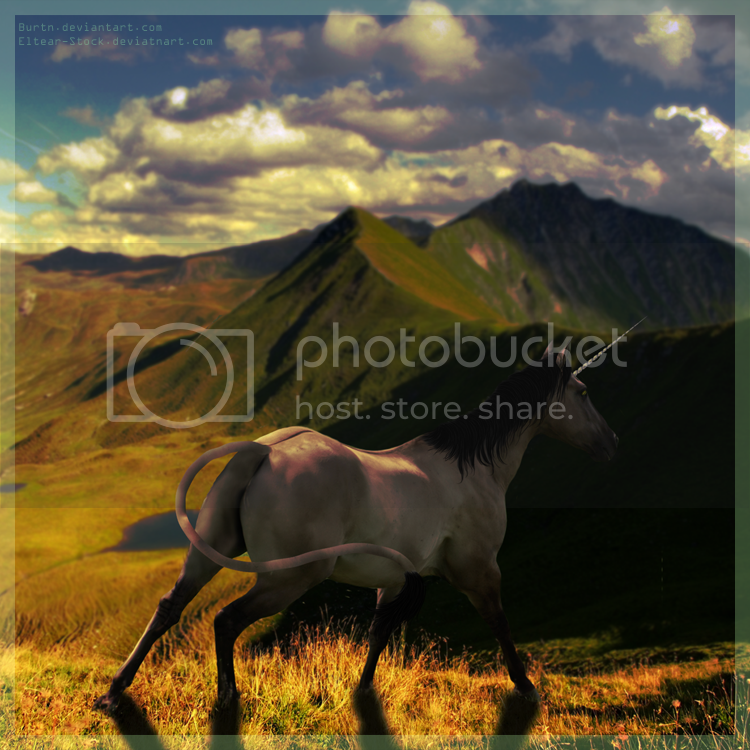 The mare stood, with hope rising, slowly but surely, at her outlook on the future. She had awoken with nothing but bleak acceptance of her situation; now she saw things a bit clearer. Her throat still ached, but this Xanthos, her guard, had indeed guarded her from escape, from also from the herd and sufferance in which she would otherwise face without him there. Because of him, she was grateful, and able to foresee a path ahead that would eventually lead her home. A longing, sharp and unnerving, suddenly filled her, a wistful yearning for familiar surrounds, comforting embraces, salty sea air and woody scents. There truly is no place like home. The Nightshade's voice cut through her longing, and the mare drew her eyes away from her guard to view the bloody hued beast with glass horns. Like always, she was curious as to the tale that might exist behind the broken shard that juts from his crown, and she allowed her golden eyes to linger upon it perhaps a breath longer than was polite - she was drugged after all, and while slowly beginning to feel like herself, she was still groggy, sluggish, hopelessly lost exactly whereabouts she stood. Akaith crooned upon her back, the sounds varying from a warning hiss at the arrival of the Mender, to a puzzled, concerned purr for her bonded. The little black mare shifted her weight, the only she could communicate to her bonded that she was, indeed, alright. "Enemies perhaps; yet we hold many things in common." It was a comment given in nothing but her usual bland tones, proffered for the stallions to take and digest as they pleased. Exactly what she was referring to - why, it could be anything. Was she referring to the common thoughts she and Xanthos had shared? Or the way in which an efficient and hard worker was rewarded? Or perhaps even the fact that she now called the World's Edge her home, just as this Doctor once had? Or was it deeper than that still - that their blood bled the same hue, or that their souls existed on the same plane - a plane of mortal beings cowering beneath their Gods? The gold shifted upon her withers once more, shuffling her leathery wings about, unsettled about something - what exactly, would be left up to anyone's guess, for she could not communicate what it was she knew in any way aside from her body, which was proving frustrating for both of them. The deep, sharp golden eyes of Mirage lingered a moment longer upon the NightShade, before her elegant tiara turned to view the horizon of trees, hills and in the distance, glaciers. She was tired of this situation already, and with a desperate hope, she attempted to call upon her magic once more - the illusionary cloak that had ben her companion for longer even than Akaith had. It was then that the edges of the mare blurred, warped and lost their focus. It was not a complete performance, but broken, hazy and cloudy, as once was trying to erase her with a overused rubber eraser. The magic's touch was comforting to her, like a lover's embrace, and after a few seconds, she allowed it to drop. Promises of a future were looking grand indeed.